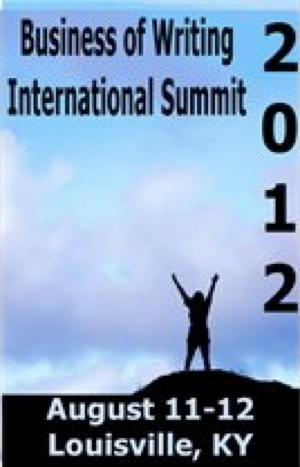 This past weekend I had the opportunity to attend the inaugural Business of Writing International Summit. They were presenting three different tracks of training sessions for writers; Self Publishing, Book Marketing, and eBooks & Social Media. While the talks were very informational, what I enjoyed even more were the people I met. I only wish I could have talked to more attendees, presenters and exhibitors. At the request of Andrea Gardner, author of Change Your Words, Change Your World, I joined her in Louisville, Kentucky for her appearances. As the keynote speaker, she got some press in the days leading up to the summit. She did some interviews and we both thoroughly enjoyed the hospitality in Kentucky. Larry DeKay and Peggy DeKay were the driving force behind the summit. I had a chance to see a bit of the behind the scenes work that goes on during a large event like this. All I can say is, WOW! It takes a special person or group of people to pull something like this off. Hats off to Larry and Peggy! Connie Williams and Sheila Tidwell are amazing women who I had the pleasure to meet. I was unfamiliar with their work up until this event. Connie's book Thinking Consciously Rocks! is on my nightstand right now to read. Together Connie and Sheila are property investment pros. I've started listening to their podcast Connie and Sheila Talk and I love it! Their personality on the show is exactly how they are in real life. They are two very authentic people. So glad I had the chance to spend some time to get to know them both. I first had the chance to meet Rik Feeney on Friday. This guy has some incredible advice. He sure knows his stuff in writing and publishing. What really got my attention were his promotion ideas and how to earn a very enjoyable living as a writer and speaker. I'm looking forward to checking out his book Writing Books for Fun, Fame & Fortune! very soon. Even my love of podcasting was addressed at this writers summit. Dave Jackson from the SchoolOfPodcasting.com and Paul Clifford of Podcasting Church fame were both on hand to teach writers about the benefits and how-tos of podcasting. I had to get to Louisville, Kentucky to find Dave who is based in my home state of Ohio, about two hours away from me. He also won major cred points with me when I found out he was a fellow No Agenda Show listener. I really wish I had a chance to talk more with author and filmmaker Stephen Zimmer. I have a feeling we would get along tremendously. He pushed through his car breaking down on his trip to Louisville to make it to the event. In triumphant style he arrived just as the panel he was to be on was getting started. Without missing a beat he stepped up to the task. Although I'm not a big fantasy reader, I eagerly look forward to checking out his work. There were so many other people I wish I had the chance to talk to and get to know a little. I look forward to seeing how this summit evolves over the next few years. It was a great resource for all those who attended I am sure. I have a feeling the Business of Writing International Summit will become the premier writing conference of the midwest in a short amount of time.